Gladstone Touch Footy for the win. 22 Mar Gladstone Touch Footy for the win. Touch Football is easy to play, totally inclusive and taps into the excitement and skills of the ‘Greatest Game of All’. Games are fast and exhilarating and retain all the skills and movements without the bone-jarring tackle, biff or nightclub incidents. According to Touch Football Australia CEO Colm Maguire, the secret to Touch Football’s success is its social nature. The slogan: ‘A place on the field for everyone’ says it all. “Friends and colleagues can get together and have a game anywhere. And mixed competitions make it easy to get a team together. I play in a mixed team with my 10 and 14-year-old daughters. Age is no barrier either and you can play from the time you can pick up a ball until your seventies or beyond,” he says. 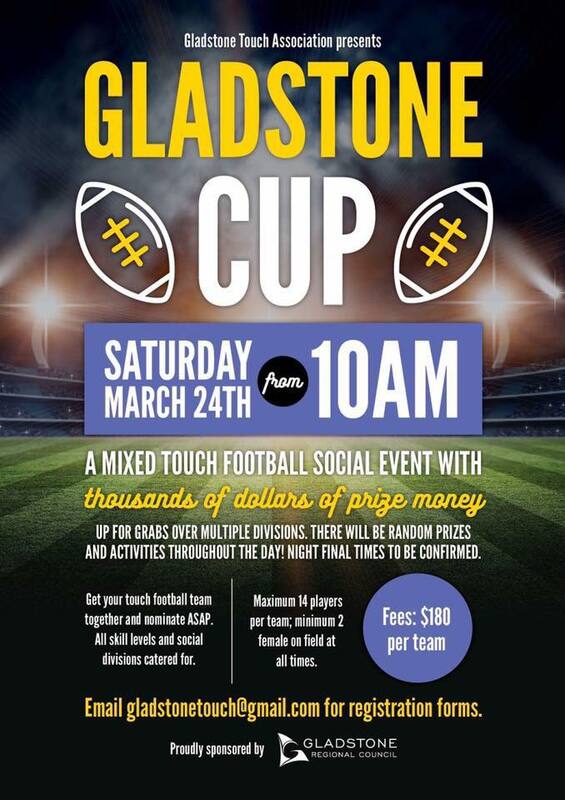 To join in the fun here in Gladstone make sure you book a place for you, workmates or the family to take part in the Gladstone Touch Association upcoming Gladstone Cup. It’s on this Saturday (25th March) and is a mixed touch footy event with pries and fun to be had for all. Maximum 14 players on the field with a minimum of 2 female players. If you are more into the‘social’ spectating that’s ok too. Gladstone Touch Association have been making memorable events happen for years too inside the great venue at Harvey Road. If you want to support the club and enjoy the clubhouse facilities available for function hires with full bar then contact Gladstonetouch@gmail.com for bookings.